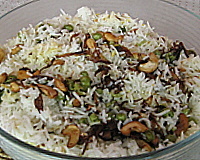 Matar Pulao means a peas pulao. Pulao is a Indian rice dish in which a good quality basmati rice is cooked with mixed vegetables, just peas, cumin or meat. The main point to remember when making a pulao is that all the grains should remain separate after cooking. Which means that rice should be cooked in just the right amount of water or stock. Nothing less than a good size basmati rice should be used to get the best flavor and appearance. Pulao and Biryani are the two types of Indian rice recipes that form an integral part of any formal or even informal lunch or dinner.The main difference between the two is the cooking technique. To make a basic pulao, rice is first tempered in desi ghee (clarified butter) and spices,then exact measured water is added to the rice. For 1 cup of rice 2 cups water is used. If using a pressure cooker, for every 1 cup of rice 1 and 1/4 of water is sufficient. Biryani, on the other hand is made from par boiled rice, which is then assembled with the other ingredients, sealed and put on dum for at least 45 minutes (put on a very low heat, so that all the flavors inside the pot amalgamate well). Simple pulaos like this matar pulao are served with a curry dish and raita (yogurt recipes). Whereas vegetable pulao is a complete meal in itself. It is usually served with a raita. In order to achieve the best flavor and aroma in your pulao, you must use the right spices and desi ghee (clarified butter, a little amount should suffice). Strain the rice and let it remain in the strainer. Fry the onion on a low to medium heat until light brown. Drain on kitchen paper and keep aside. Heat oil in a non stick deep pan / pot (big enough for the quantity of rice), add the bay leaf, cloves and cinnamon. When they crackle, add the peas and green chili. Saute till the peas get half cooked. Meanwhile, in another pan or kadai, heat the ghee and fry the cashews on a medium heat until evenly light brown on all sides (keep stirring all the time so that they don't get burnt). Immediately take them out with a slotted spoon. In the remaining ghee add the caraway seeds (shahi jeera), cumin seeds and cardamoms. Saute for a minute or so and add the rice from the strainer. Saute till all the rice grains are coated in ghee. Transfer this rice to the pot with peas. Add the measured hot water, fried onions, cashews and salt. Mix with a spoon and check if the salt is right. If it is just right then you might want to add some more salt as the rice will soak up the water and salt. You can't add more salt once the pulao is cooked. Bring it to a boil, then cover with a tight lid and simmer for 15 minutes (very low heat). Open and check, if all the water is absorbed and the rice is almost cooked, then turn off the heat and cover again for 5 minutes. The rice will cook in it's steam. That's it. Serve the hot matar pulao with a vegetable or meat curry or eat it just like that. A raita always goes well with a pulao.